I am in process of fixing blob-Rinco famiclone. Console works fine but... there is problem with joypad 1, which causes (even if no pad is present) every game to think that all buttons are pressed at once. 1. Unfortunatelly, strobe & clock lines are dead. And shorting joypad-data to vcc/gnd does not stop games to detect all buttons being pressed. 2. I tried the old trick with putting 0/1 on the data bus when there is read cycle from $4016 but it also does not change anything. So probably this clone has the internal joypad port separated from cpu-bus. 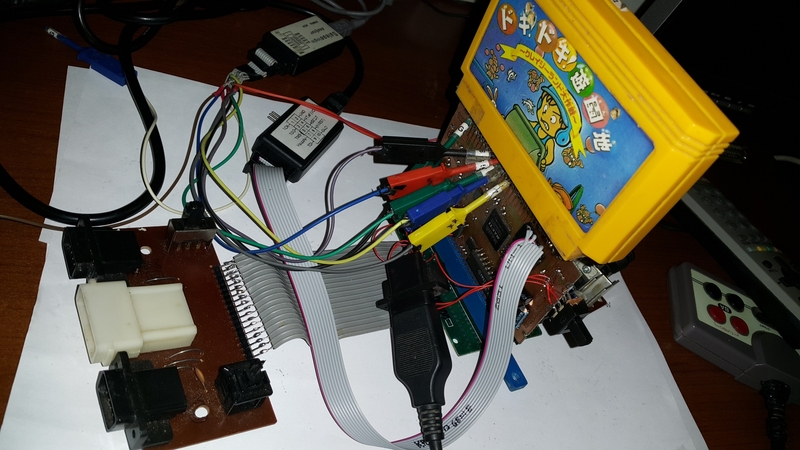 Normally I would throw it into garbage but it has the unique PAL/NTSC region switch feature, so..
but this time, after read cycle from $4016 happens, I am injecting code that loads into accumulator value from joypad-data line (+ and I also generate clock/strobe signals). This value is read by FPGA from 'new' joypad port. I checked a few games and all of them reads $4016 into accumulator and not inyo any other register. And all this code is executed from ROM, not RAM, so it should work. And it works! I managed to make joypad port working. I tested on some NROM/MMC1/UNROM games and all of them works. However, when it comes to MMC3 (for example Doki Doki Yuuenchi, SMB3) - they hang just after second after start. 2. Maybe during the opcode injection, when cartridge ROM is disabled, IRQ is triggered (because MMC3 is the only mapper from the above that uses - it). But looking on the scope, at the moment when something starts messing, there is no IRQ pending. (I checked this even on second, working console, and it is exactly the same). I checked on true hardware MMC3 cartridge and flash cartridge and also. But looking at the waveforms, there are tens of correct 8 reads from $4016, but suddenly there appears a moment that during some of that injected code (here - during fifth read from $4016), CPU address bus is the same for three cycleS! Even if CPU would read invalid data and treat it as opcode, it wouldn't stay for 3 cycles! Anyone has idea what am I missing? Maybe some weird DMA/APU thing is taking place at this moment? That pattern of three reads in a row from $4016 sounds like the APU DMC DMA glitch. See "APU DMC" section "Conflict with controller and PPU read" on the wiki. If you also get freezes in Contra or Kung Fu or Hello Kitty World or LAN Master or other games that use a discrete mapper and sampled audio, or games like The Legend of Zelda or Dr. Mario that use MMC1 and sampled audio, then it's probably that. Workaround: If you see two accesses to $4016 within 8 CPU cycles or so, ignore the later one. Yes! Hello Kitty World freezes too, thanks! I think the problem is harded than I thought, because this APU steal cycle does not only affects reading at $4016, but it can happen anytime, during reading any memory cell. This makes hard to determine how the CPU is behaving, and If it happends during the injection process (for example - when I am injecting the $A9 operand), I cannot go to next state on next cycle because on next clock cycle, CPU address will be the same and I still have to feed the $A9. So I need to watch addresses on the CPU bus and switch to next state only if address is incremented. Ha, I did it! I thought overnight how then everything works if CPU halts randomly. But looking from the memory's perspective, it does not matter if the executing sequence is xxxx, xxxx + 1, xxxx + 2 or xxxx, xxxx, xxxx, xxxx + 1, xxxx + 1. It just returns data from the cell that program counter wants! So abandoning state-machine approach and trying to predict how many cpu cycles the whole sequence takes, FPGA must behave exactly the same way like memory - just return data from adequate cell. So now there are only 2 states: IDLE (normal mode) and INJECTION (during injection). 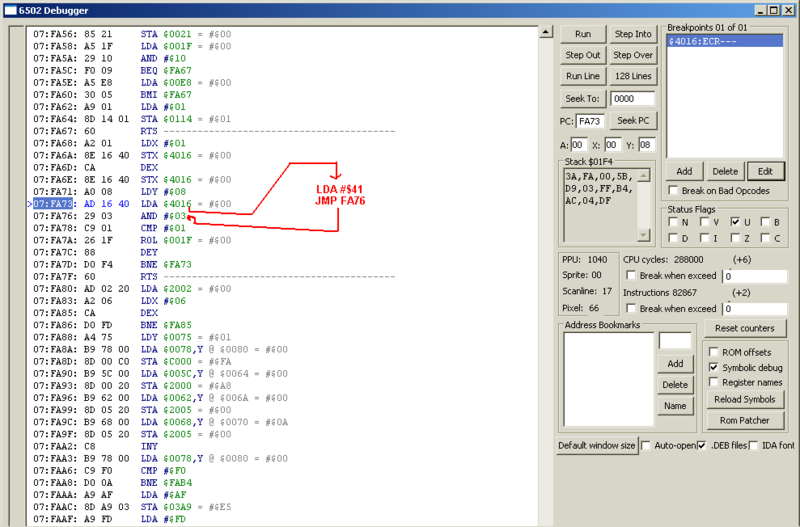 I used EPM3064 CPLD because the code took barelly 47 macrocells (out of 64), but this chip has 5V tolerant inputs. I projected small PCB, soldered it underneath the original cartridge slot (this model had 2) and cutted one trace. Unfortunatelly I realised that not only the joypad1 port signals were missing, but those for joypad2 too! Unfortunatelly all of 30 pins in this CPLD were used so I was unable to generate signals for JOY2-CLK / JOY2-D0. 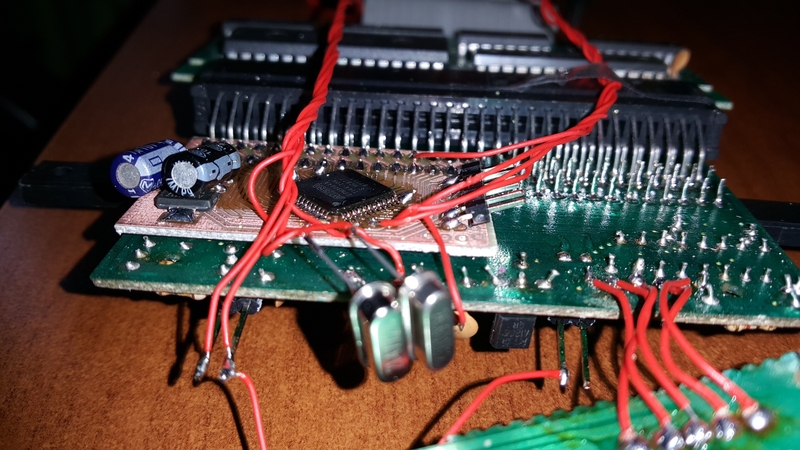 * try to utilize JTAG pins from it too (that would give 4 additional pins). 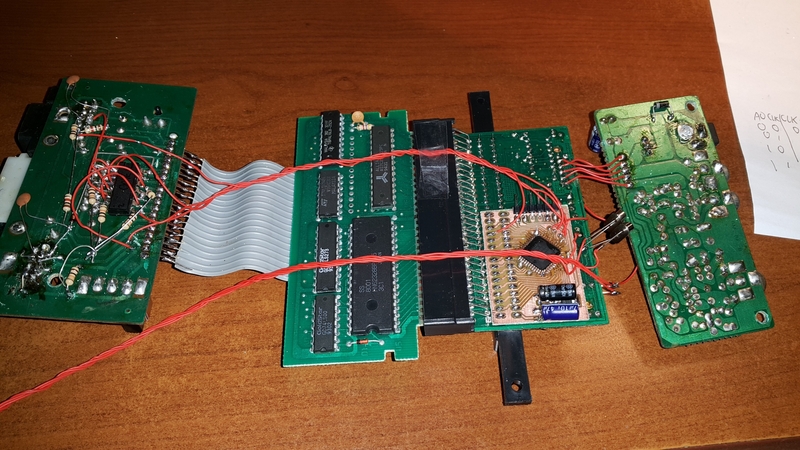 It is possible to program the chip so that afterwards those JTAG pins are regular I/Os, but future reprogramming is not possible without High Voltage programmer! But I found that one guy confirmed that applying +12V into OE pin and programming using regular programmer works! 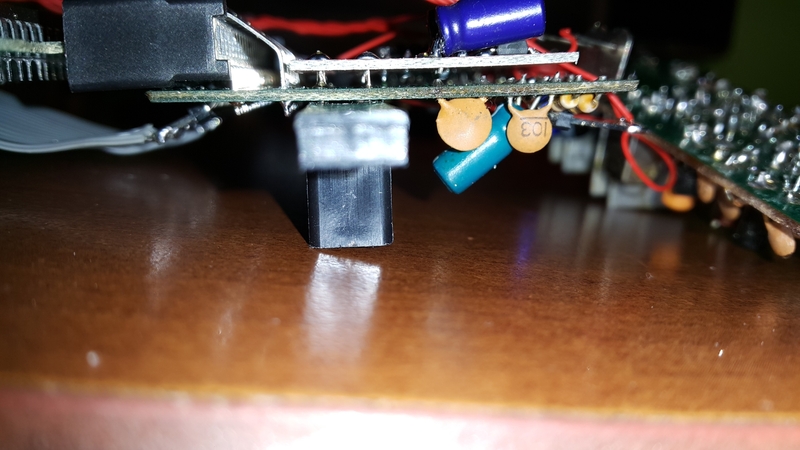 Unfortnuatelly OE pin was connected to one of address pins so applying 12V to it would be dangerous, so maybe..
* are all connected pins neccesary? A0..14, CPU_ROMSEL, CPU_R/W, M2, CART_ROMSEL, D0..D7, JOY-STROBE, JOY-CLOCK, JOY-D gives 30, but are all address lines neccesary? I need to decode $4016/$4017 = 10000000001011X but maybe just OR A13..A5 using diodes and fed that ORed sum into FPGA? That would reduce a lot, but what about the JMP opcode which need to know precise addres? I can replace it with BRANCH which uses relative! I took 7400 from shelf and connected it and it works (just needed to to add 56p caps from J1-CLK/J2-CLK to ground because of some oscillations) and both ports of this cosole works like charm!